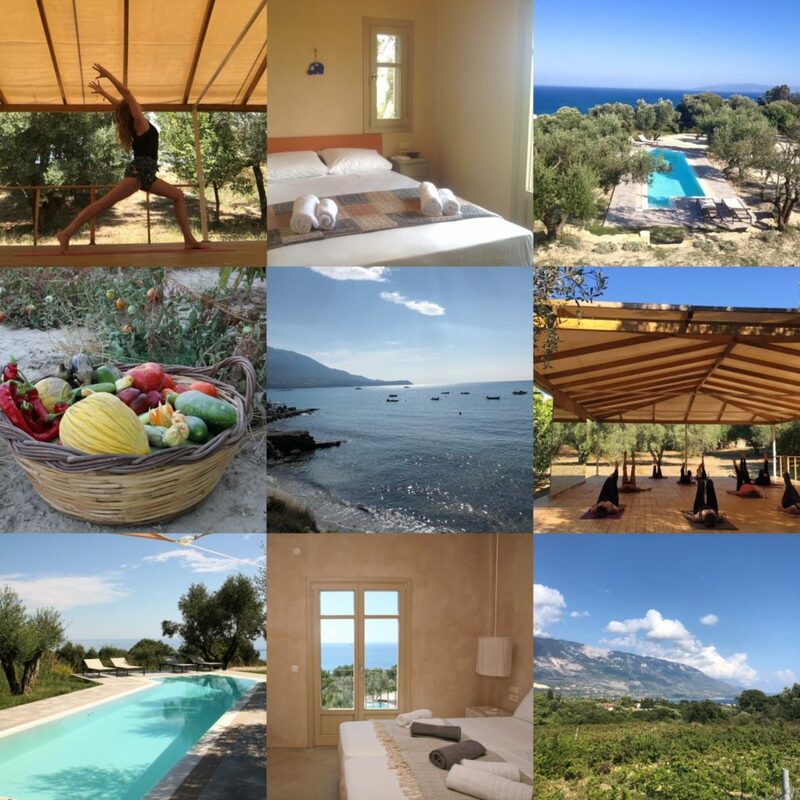 The beautiful Vericoco Retreat in Kefalonia, Greece offers us the chance to reconnect with nature; to pause, step back and recharge. Set within olive groves and with spectacular views of majestic Mount Aenos and the Ionian sea, the grounds at Vericoco are spacious enough for you to enjoy plenty of quietude, yet conveniently laid out to provide easy access to yoga shala, 11m pool and outdoor living areas. A peaceful 10 minute stroll down hill offers you the choice of Vericoco’s two nearest beaches; both with trademark Kefalonian crystal-clear shallow waters. Spartia beach offers the advantage of the local facilities for those who want to grab a drink or snack, and Thermanti has the advantage of being secluded as it is only accessible by foot, making this a rather magical place. There will be twice daily yoga sessions at the shaded outdoor yoga shala; flow in the morning and restorative and meditation in the afternoon. We will have Wednesday afternoon off, the perfect opportunity to explore the island a little more or take a boat trip to visit hidden coves along the shoreline. Kefalonia itself is a lush green island in the Ionian region, famous for its turquoise seas and clean sandy beaches. One of the largest Greek islands, it also boasts the impressive Mount Aenos with thick fir forests as well as underground caves and ample countryside. There is a variety of accommodation at Vericoco, from top of the range en-suite rooms within the recently built luxurious villa, to shared rooms within smaller apartments situated very near by. The pricing reflects the different room types.You will eat well with two plentiful vegetarian meals a day; brunch after morning yoga and dinner every evening. The cuisine at Vericoco is grown locally, freshly prepared and delicious. There are three restaurants nearby and two shops in Spartia village and as all rooms have access to kitchen facilities, you can prepare your own lunch/snacks as you like. From £575 for shared accommodation – £1050 for single supplement luxury en-suite rooms. Please enquire for full details. The price includes en-suite accommodation, two meals a day and all yoga sessions. To book your place please email me. A non-refundable deposit of £300 is required, with the balance in full payable by 1st March 2019. Take some time out for yourself, soak up the sun and get deeper into your yoga practice with me in magical Andalusia. There will be twice daily yoga sessions; flow in the morning and restorative and meditation in the afternoon, at the stunning yoga venue, Centro Santillán, twenty minutes up in the hills from Malaga with a state-of-the-art yoga studio that opens up to sea views. Santillán has been named one of the best global yoga retreats by the Guardian, read the article here. Set in a tranquil, secluded location, Santillán is a large mediterranean paradise with extensive gardens, a saltwater swimming pool with a spacious sun deck and a variety of hillside walks. The countryside location is wonderfully peaceful, Santillán is surrounded by mountains and has breathtaking sea views, with Torre de Benagalbon beach only ten minutes away by car. The bedrooms are spacious and ensuite, all rooms have large balconies offering stunning views. Double, twin and single accommodation are all available. Facials, massages and shiatsu will all be on offer during your stay. You will eat well with three plentiful meals a day, the food is grown locally, freshly prepared and delicious. To book your place please email me. A non-refundable deposit of £300 is required, with the balance in full payable by 1st June 2019. I am returning to beautiful Tilton House near Lewes in East Sussex for a yoga weekend next year, from Friday 15th- Sunday 17th November 2019. This will my fourth year at Tilton House, it’s a special place with wonderful energy, I do hope you can join me. The yoga weekend will encompass asana (both flow and restorative), pranayama, mantra, mudra and yoga philosophy. Tilton House is located in a stunning, unspoilt setting on the South Downs, just in front of Firle Beacon, one of the highest points on the Downs which rolls back to the track from the door. It’s no coincidence that the Bloomsbury Set, Virginia Woolf, Maynard Keynes, T.S. Elliot and other visionaries took their inspiration from wandering the wild ancient landscape to escape, muse and reflect. During this retreat you will have time to totally unwind around our yoga sessions; you could enjoy the countryside by relaxing in a hammock in the pretty gardens or walking the Downs, visiting nearby Charleston, enjoying a holistic massage or treatment on site or unwinding in the cedar wood sauna. All accommodation (double, twin or triple rooms), yoga classes and meals (freshly prepared and vegetarian) are included in the price of £395pp. There is a £150 (non refundable) deposit to pay that will secure your place with the balance in full settled by 1st September 2019. Please email me [Email address: ruth #AT# ruthy.plus.com - replace #AT# with @ ] to book. © 2018 RM Yoga. All Rights Reserved.